On Friday, UEFA finally gave their official ruling on the punishments for the abandoned EURO 2016 qualifier between Albania and Serbia. 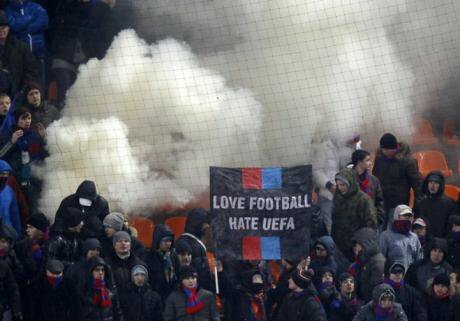 As is often the case when UEFA or FIFA are involved, both parties and fans of both squads were left feeling aggrieved and unhappy. Both the Albanian and Serbian FAs have criticized the ruling as unfair to their respective side and unduly lenient on their opponent. Both have said that they will appeal to the highest level to overturn the sanctions. Finally, both remain deeply split over what happened that night in Belgrade and who ultimately holds responsibility for the football match’s descent into political chaos. While UEFA had an opportunity to help diffuse the political tensions surrounding this situation, their punishments will instead only inflame the heightened political rhetoric. Much has been written already about the match and the immediate aftermath of the game, so I won’t rehash those events (you can see my immediate reaction as it unfolded here). In addition, in light of the events on the field, both Prime Minister Aleksandar Vučić of Serbia and Prime Minister Edi Rama of Albania have made contentious comments on Twitter and in the press, using the same rhetoric about “normal Serbia“ and “normal Albanians“. Rama’s historic visit to Belgrade was also postponed until November in light of the events, and Vučić still refuses to say that Rama’s brother was not involved. The whole event turned into an episode of high political drama, or rather maintained its political drama, just as predicted. In this context, UEFA announced their decision to award Serbia a 3-0 victory in a match Albania had forfeited, dock three points from Serbia for the pitch invasion, order that Serbia play their next two games behind closed doors (meaning no fans will be allowed at the game), and fine both teams 100,000 Euros. Thus in terms of qualification, Serbia has a victory but no points from the victory, though three goals in their favor will mean a lot if the team is tied with anyone on points, since goals scored is the first tiebreaker. In fact, looking at the Group I table, Serbia now has three more goals than any other team in the group. This could potentially get even more contentious as Albania and Serbia will seemingly be battling it out for third place in the group behind Denmark and Portugal, and the right to go to a playoff to determine whether they will qualify for France 2016. Those three goals may very well prove to be the dividing line between the two teams, and the lack of points from the game might prove deadly to each of their qualification chances. Given all this, it makes sense that both teams would react so strongly against the rulings. How was this ruling even arrived at? Why did UEFA decide that Albania should forfeit the game after fans charged onto the pitch during the incident? As reported the night of the game, the referee in the stadium announced that the field was safe to play on after the break, but the Albanian team refused to continue. Thus, according to official UEFA policy, it counts as a forfeit. The Albanian FA now claims that they never refused to play, but instead insisted that it was too unsafe to play. Meanwhile, the Serbian FA are protesting the ruling because they claim that the whole event was instigated by the Albanian side, and believe that as hosts, they should be treated the same way Italy was following the infamous 2010 “Genoa incident“. The incident in question was a Italy-Serbia qualifier abandoned after visiting Serbian fans continuously threw objects onto the field and rioted in the stadium. The decision resulted in light punishment for Italy and a forfeit for Serbia. The Serbian FA’s logic sees Serbia’s role in this month’s match as akin to Italy’s, and Albania’s role as akin to Serbia’s. In the end, both sides are upset, as the sanctions will undoubtedly make qualification that much more difficult. After 10 days, some of the vitriol seemed to be dying down. Then the UEFA decision was announced, and now it appears that both sides are angry at each other yet again. What should UEFA have done instead? UEFA should have looked at the broader political context, which they had already failed to do by allowing Albania and Serbia to be in the same group at all, a decision justified on the basis that the two countries had never fought a war against one another. The most reasonable decision would have ordered that the game be replayed on a neutral site behind closed doors, with both sides fined, and Serbia given a multi-match, behind closed doors ruling. This would not have allowed the political situation on the field to determine the outcome of the game, but instead allow the actual players to determine the outcome. There would have been massive logistical problems involved in setting such a game up, but since Group I had just five teams while the others had six, there were plenty of FIFA dates available to make the game up at the cost of one friendly. This all could have been done, but instead UEFA decided to impose a forfeit and prevent the teams from settling the matter on the field. Most worrisome is that UEFA has undoubtedly added to the political discord, as the result of the game will continue to be litigated in the press and in the courtroom. Two things are particularly troubling. First, with Rama’s visit still happening in November, the historic meeting now has the potential to be derailed, and the focus shifted from key regional issues and economic cooperation. With Rama already saying Serbia should recognize Kosovo, additional flash points between the countries can only serve to make the meeting less productive. Second, Serbia returns to play Albania in Elbasan for the penultimate game in the group, and potentially the deciding match in terms of who proceeds. Serbian supporters will not be allowed to travel to Elbasan, but the UEFA ruling will likely bring added tension to the game anyway, as Albanian fans and players will still feel aggrieved at the situation. UEFA had a chance to make sure the return game in Albania would feel like a normal football match, but instead they have almost guaranteed the continuation of political theater. Of course, one should never be surprised when UEFA or FIFA does something that makes little sense. But in this case, UEFA only created a ruling that does more to further the political reactions in football, instead of removing the political element from the game. Instead of trying to bring the focus back to sports, they have given an even larger stage to politicians and their political rhetoric. And for an organization that explicitly states that politics do not belong in football, they seem to be doing their best to ensure they remain intertwined in Serbia and Albania. This article was originally published at the Balkanist.